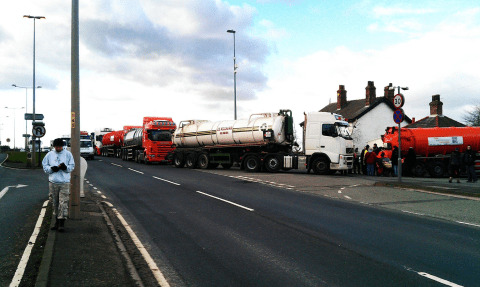 UPDATE 10:50 on Sat 15th Feb.
Protestors at the Barton Moss fracking site have held off all deliveries to the rig for two days after a judge ruled that the ‘road’ they were using is actually a footpath. Will iGas now back off for good? Trucks backing up at Barton Moss following the ‘footpath ruling’. Photo: Barton Moss Protest Camp. After a District Judge ruling in Manchester Magistrates Court ruled this week that Barton Moss Road was a ‘public footpath’ rather than a highway with vehicular rights, Greater Manchester police have backed off – and protestors are celebrating! The ruling means that the road is still a right of way for pedestrians, but not for vehicles. So there no offence is committed when protestors block vehicular traffic. The drilling at Barton Moss is already well behind schedule, thanks in part to the protestors, but now two whole days have been added – with no end in sight. “We estimate that the drill-rig is costing iGas somewhere in the region of £20,000 per day, and their total daily operating costs will be somewhere north of £50,000”, claimed one protestor on the Barton Moss Community Protection Camp Facebook page. The ‘footpath ruling’ may have other consequences. For a start, the 100 or so protestors that have been arrested for ‘obstructing the highway’ cannot be charged with this crime if they were obstructing vehicles, as the vehicles have no right of way on a footpath. Futhermore vehicles on the site itself may be trapped there for some considerable period as it is an offence under Section 34 of the Road Traffic Act to drive a vehicle on a footpath, unless the vehicle has a specific right to use it, or in case of a life-threatening emergency. Indeed the protestors’ next move may be to press the police to prosecute the truckers who have been illegally driving on the footpath – yet another nightmare for iGas and its subcontractors. Securing confirmation from a Judge about information that is clearly displayed at the end of Barton Moss Road has yet to be proved to be a solid victory for the Protectors. It seems that the Police are prepared, for the time being, to concede that pedestrians have the right of way but, undoubtedly, they will be consulting their senior officers and legal representatives to find a way around the deadlock. Meanwhile the main issue, High Pressure, High Volume Fracturing & all its incumbant ills has been lost from the forefront of discussion. Stopping trucks from churning up a fragile, unadopted footpath is one thing, but stopping Fracking COMPLETELY anywhere in this country is the primary objective that the Protectors are intending to achieve. The Oil & Gas corporations & the British government are posing a serious threat to the entire British ecology, water aquifers & health of every living being in this country. When we stop this vile destruction & dash for cash, revealing it for the toxic & diabolical instrument of death that it is – then we will truly celebrate a victory, until then we, the Protectors, will continue our unremitting objection & resistance. Some good news at last! Bloody good on ’em. Mind you, when I read about the ‘massive tailback of lorries’ I do feel a bit sorry for the long-suffering people of Irlam with their overloaded dual carriageway…still, it’ll be for the best in the end.